Having kids and beautiful home design don’t typically go together but when we built our home (pre-kids) three years ago, we built it and designed it knowing we wanted to start a family here. My husband and I had totally different design styles, he was way more modern and I was more traditional/shabby chic (is that even a thing?). But we combined our styles with one common goal: make a comfy-cozy home that can withstand the test of time (aka our future tiny humans). After over two years of having our little ones in this home I can honestly say we did pretty good. 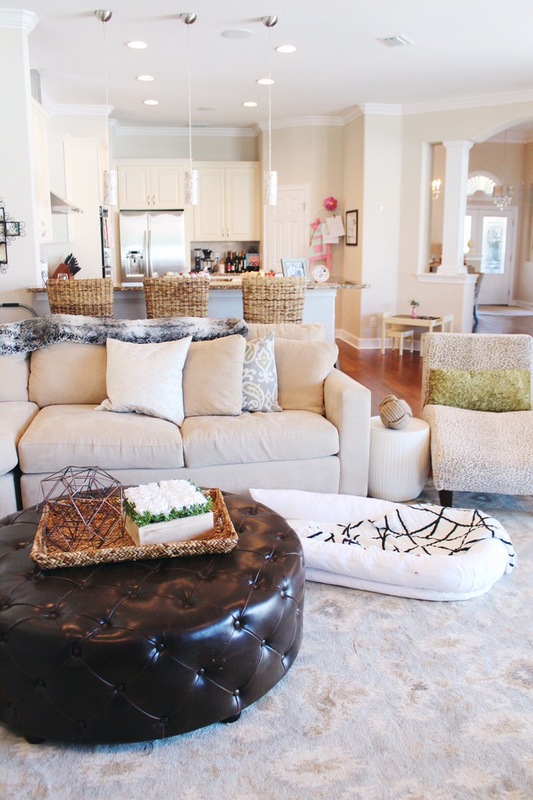 I LOVE the functionality and look so much that I thought it would be fun to take you on a tour of our home, one room at a time, in a fun new blog series. In this series I will post a room in our house once a month (maybe more frequently if I can get my act together) for you all to view! 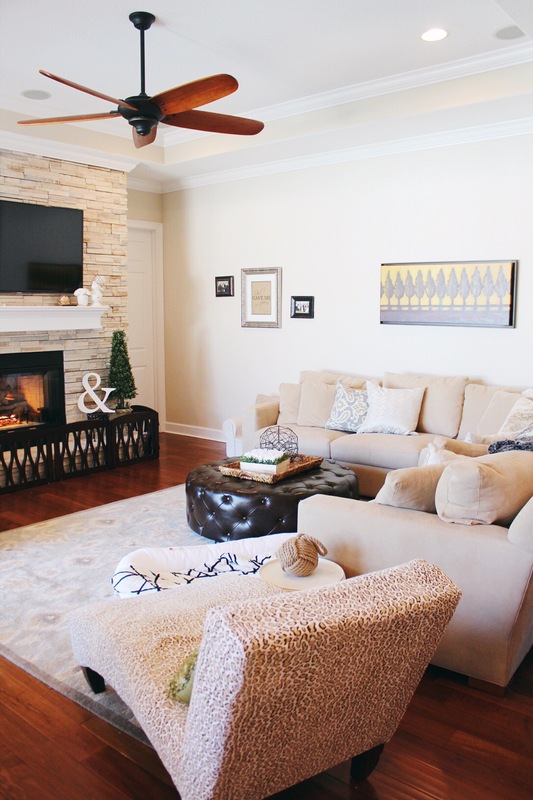 So first up I bring you in, Kid Friendly Home Design: The Family Room. 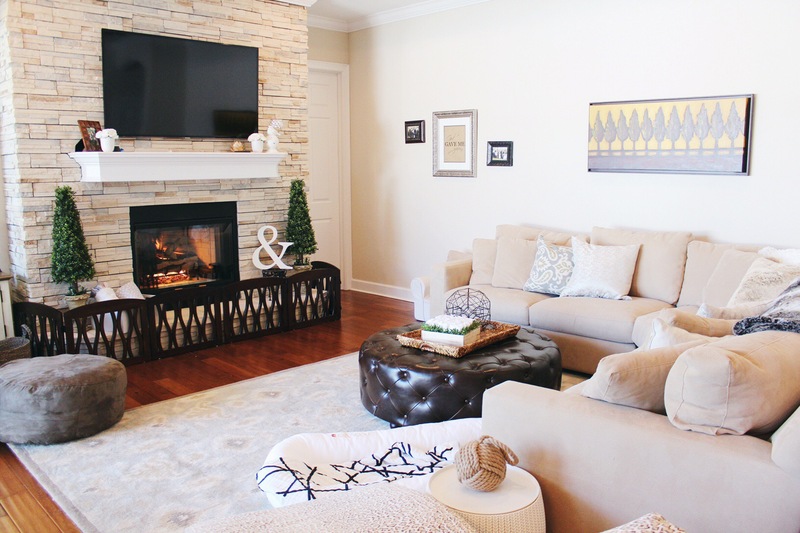 Our couch is the Axis II 3-Piece Sectional Sofa from Crate & Barrel. We searched high and low for a couch that we both agreed on. We even bought a few prior to this one and had delivery scheduled for when our home would be completed but each time we “returned” the couches and just kept going back to this one. It was by far the most functional and comfiest couch we came across. Most sectionals have that weird middle part where nobody can actually sit but this one arched in a way that made that corner seat comfortable and accessible so it wasn’t a wasted space. But what makes this couch even better is the fabric. At first glance we get told, “A cream couch with kids? You’re nuts!” But this couch is made of the most perfect microfiber that really fights stains well. I should know, we have had two glasses of red wine spilled on it and they just wipe right off! The couch itself also came with a cleaning service so if there were ever a stain we couldn’t get out ourselves, they would come out and clean it for us. I thought the same thing about the color of the couch before purchasing but my husband really didn’t want a dark couch. So I compromised, and I am so glad I did. I did however tell him that we could get the cream couch but I refused to stress out about it getting dirty and little did I know, I really don’t have too! Next, to the living room, we have our home office, which we have designed lead into the family room so that we can communicate with the children and we wanted it to look stunning as we will be working there for many hours! Many businesses have started employing people to work at home as this eliminates the need for them to invest money in buying an office unit for their employees. This will save the business lots of money and may save them from having to organise a merchant advance. If you are wondering, what is a merchant cash advance? You should check out Delancey street for more information on how you can get mca even with bad credit! There’s so many other bits of furniture that you need to think about. It’s not just the couch (even though that’s the most common bit of furniture that people use). You have to look at the accessoriese that go with it. Your cushions, coffee table and others. Did you realise how many different styles of coffee tables there are? Like you could get a rectangular glass coffee table if you wanted, or something completely different. The ottoman is from a local Matter Brothers store. Knowing we wanted to make our living room kid friendly we went with a soft/padded leather ottoman with a little style. I love that its not just a boring piece and that it adds texture to the room. Besides the design of the ottoman it is perfect for little ones because the leather is super easy to clean and there are no sharp edges to fall on. The white and wood entertainment center is from here as well. Table top decor on the wicker tray are from HomeGoods. 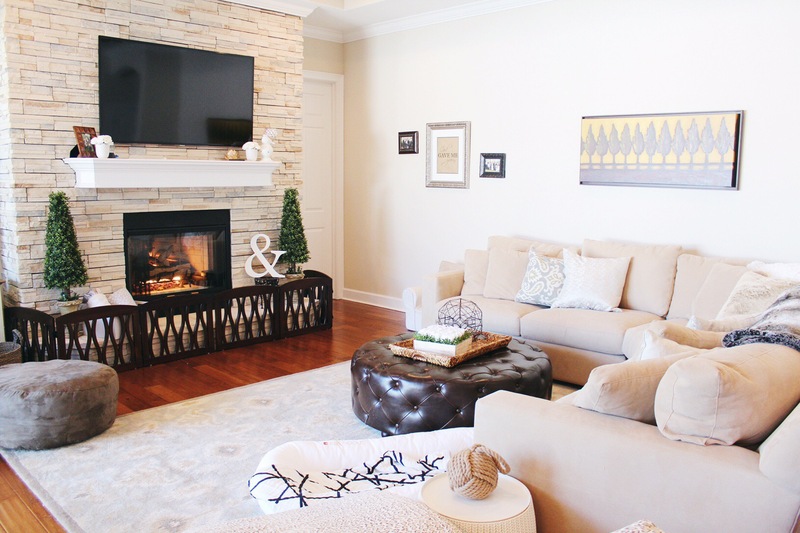 Faux fur throw blanket and pillow are from Pottery Barn. Rug: Our rug is the Marchesa Rug from Ballard Designs. It adds the perfect pop of color to our room. 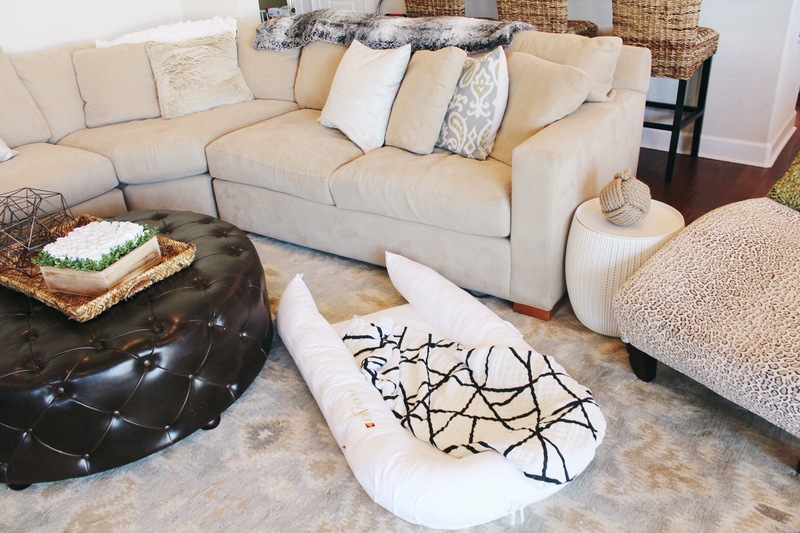 Of course, my girls favorite part of the room is our Dockatot Grand! Find out more about this awesome multi-functional baby/toddler accessory HERE. Side table between couch and lounger is from Target and opens up to storage inside the table. 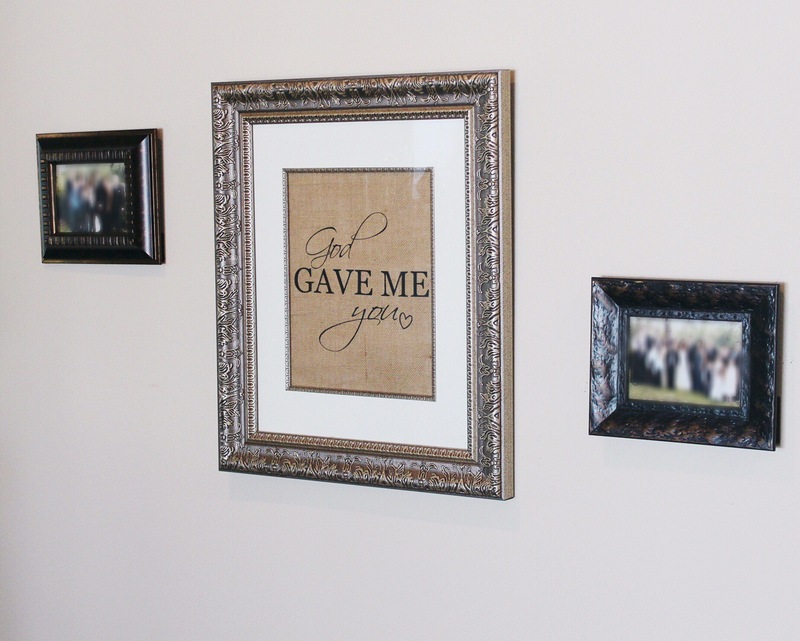 God Gave Me You sign is from Burlap Blondie on Etsy // Frame sold separately- We have our Wedding photos with each side of the family on either side! A sweet memory of the day we became one! Gate around fireplace is actually two freestanding dog gates from Grandin Road called the Wavy Wood Three-Panel Pet Gate. Adult sized bean bag is called a Sack Daddy found HERE. I hope you enjoyed the tour of our living room! 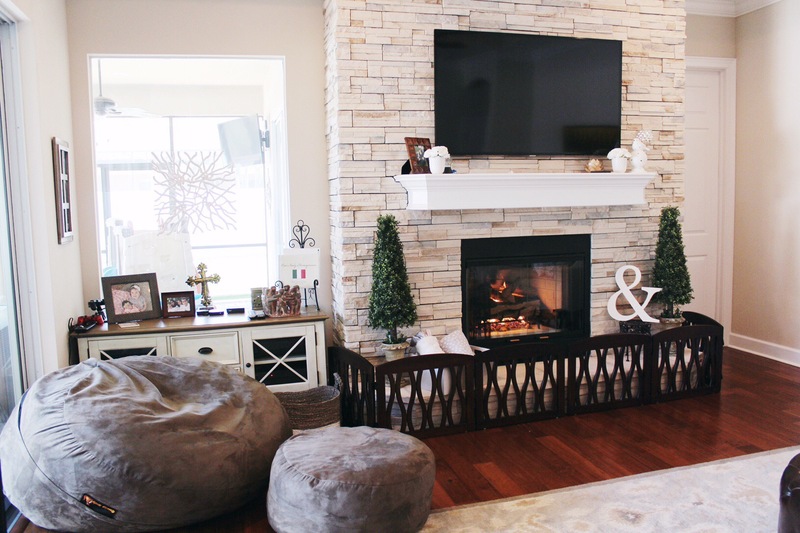 Please feel free to leave feedback or if you have any other questions regarding our family room! I am happy to answer away! This is such a beautiful space! Also could you tell me where you found your kitchen pendant lighting? They are fantastic! I love the colors you chose. ?